Angellica Bell presents a concert dedicated to the magnificence of the human voice. Live from the Troxy in London, with the BBC Concert Orchestra conducted by Jae Alexander. 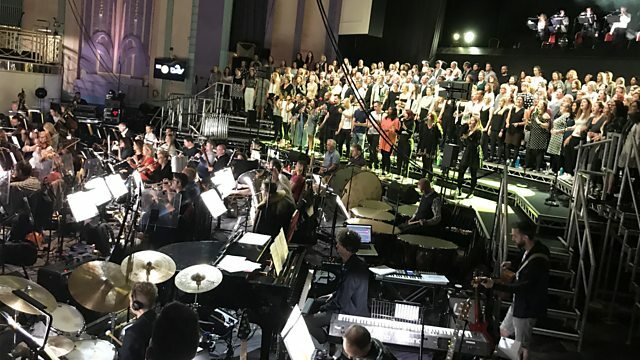 To celebrate BBC Music day Radio 2 brings a huge cast to The Troxy for a special 'Friday Night Is Music Night' celebrating the magnificence of the human voice. Featuring the 60 piece BBC Concert Orchestra, conducted by West End Maestro Jae Alexander; musical theatre star John Owen-Jones; Brit nominated classical soprano Carly Paoli; jazz legend Madeline Bell; Roxy Music's Phil Manzanera and Andy Mackay; the all star West End singers 'Dynamic Vocals'; and the massed voices of 'London's coolest Choir', (Time Out) 'Some Voices'. Tonight's show will be live on BBC Radio 2 and will feature songs including Elbow's 'One Day Like This'; Coldplay's 'Vida La Vida'; ABBA's 'Dancing Queen'; David Bowie's 'A Space Oddity' alongside musical theatre classics from 'Rent'; 'The Phantom of the Opera'; 'Little Shop of Horrors', 'Joseph and the Amazing Technicolour Dreamcoat' and more, including the world premiere of a new piece by Roxy Music's Andy Mackay, 'Praise' and the Oscar nominated Lin-Manuel Miranda song 'How Far I'll Go' from 'Moana'. Presenter Angellica Bell. Catch-up on Radio 2's highlights from a special day of music.